Chanil-Lee is an Argonian sorceress located inside the Six Fishes in Ebonheart. She wears a steel cuirass and Imperial steel boots. Under her armor, she wears a common shirt and pants. She wields a steel shortsword and carries up to 19 drakes. Like all Argonians, she is immune to poison, has a resistance to disease, and can breathe underwater. Aside from that, she knows Strong Feather, Ulms's Juicedaw's Feather, Fifth Barrier, Bound Cuirass, Bound Helm, Bound Gauntlets, Bound Boots, Bound Shield, Dire Weakness to Poison, Dire Weakness to Shock, Sotha's Mirror, Vivec's Feast, Spell Absorption, and Dispel. She is a Journeyman in the Mages Guild and a minor trainer in Mysticism, Destruction, and Enchant. 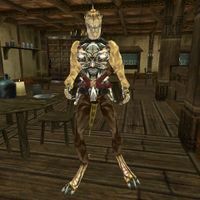 If you ask her about the latest rumors, providing your disposition with her is at least 30, she'll say: "One hears whispers in Ebonheart of the Lord's Mail -- that it has disappeared. The best armor in Tamriel, it is."